Delivery trucks and commercial vehicles are critical to the economic vitality of New York City (NYC), a population of 8.5 million. Without efficient freight transportation, retail stores would not have goods to sell, restaurants would have nothing to serve, offices would have no supplies, contractors would have difficulty building, and waste would remain on the sidewalk. Between 2010 and 2015, NYC added more than 370,000 residents and 520,000 jobs. As NYC’s population continues to grow, the demand for freight transportation will also increase, resulting in more trucks on the road. Daily freight trips between 2010 and 2013 increased by 5.7%.  Approximately 97,000 trucks and commercial vehicles cross NYC boundaries each day, 25,000 moving to and from Manhattan. That’s a lot of traffic during the busiest parts of the day. The continuous growth and demand on our transportation system have caused increased congestion, which reduces economic productivity and diminishes the quality of life. To address these issues, NYC’s Department of Transportation (DOT) in partnership with Rensselaer Polytechnic Institute (RPI), stakeholders and research partners implemented an Off-Hour Truck Delivery Pilot program from 2009 to 2010, funded by the United States (US) DOT. Due to the success of the pilot program, NYCDOT is now seeking additional transporters and receivers to rethink their delivery schedule and shift to off-hour deliveries. The off-hour delivery program is intended to increase the number of deliveries between 7:00 p.m. and 6:00 a.m. within NYC, specifically Midtown and Lower Manhattan and the downtown areas of Brooklyn and Jamaica where there are high pedestrian volumes and limited curb space. Strategic scheduling of deliveries will ultimately produce community, freight transporter, and goods receiver benefits – a win-win for all! Off-hour Deliveries, attended or unattended where drivers can leave goods in a safe and secure location, will allow companies greater scheduling flexibility and store owners the ability to have products on shelves before opening. If every business in NYC got on board with the off-hour delivery program, local economic benefits could be upwards of $200 million per year! NYC DOT seeks collaboration with the freight, retail, and food sectors to educate industry businesses on the benefits of moving some deliveries to the off-hour period. DOT is exploring a number of incentives that will help companies investigate and ultimately move to off-hour deliveries. DOT and other City agencies are committed to protecting those who live, work, and visit the New York area from noise intrusion.